View from below the Triple Bridges in the Colorado National Monument. 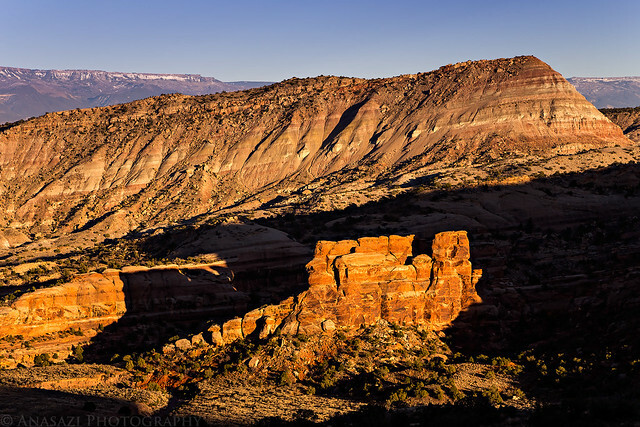 On Sunday Diane and I stayed close to home and did a little backcountry hiking in the Colorado National Monument. 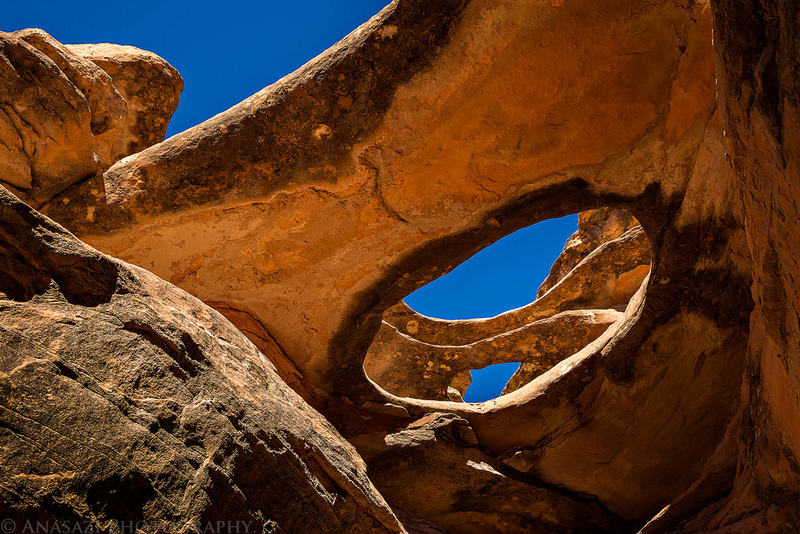 This time we were in search of a little-known set of natural bridges located at the head of a short unnamed side canyon that have no official name, but are collectively known as the Triple Bridges. In recent years a fourth opening has appeared that is becoming the start of a fourth natural bridge (you can see the tiny hole in the photo above that is below the set of two bridges), however at this point I would consider that opening so insignificant that I don’t feel there is currently a need to rename these arches to the ‘Quadruple Bridges’ – but maybe one day! 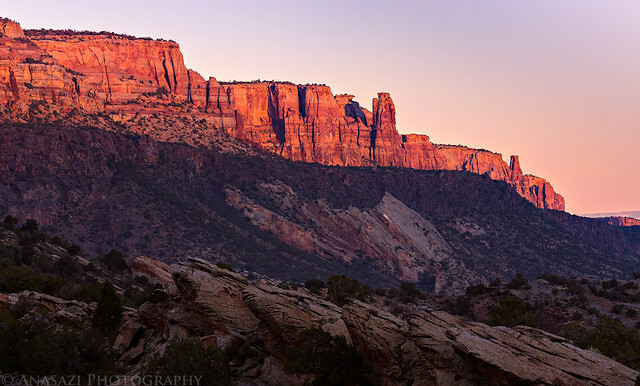 The sunrise lights up the face of the Colorado National Monument. A nice view of the Triple Bridges from below. It was a little tricky getting to this spot below the bridges which required scrambling down into a short slot canyon that I needed Diane’s help to get back out of. We make a good team! The short slot canyon that I needed to climb down into to get a better view of the arches. It’s a little difficult to tell what’s going on in this photo, but it’s a view down on the natural bridges from above. The shadowed portion right in the middle of the circle is where the new opening is beginning. 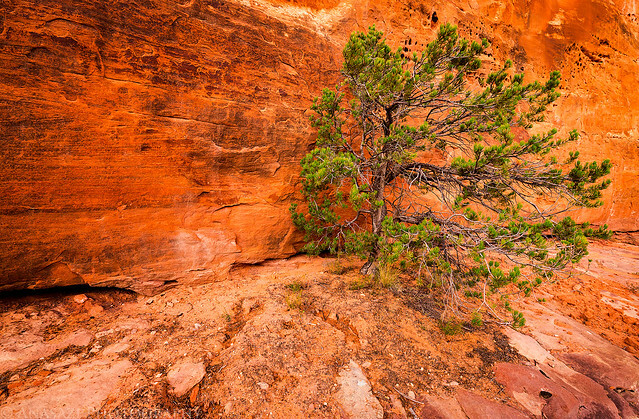 An interesting little pinyon pine tree growing up against a sandstone canyon wall. The Devil’s Kitchen surrounded by shadows.